Catasys (or “the Company”) provides big data–based analytics and predictive modeling–driven health management services for health plans. These services aim to improve member health while simultaneously lowering insurer costs for underserved populations. Catasys’ OnTrak™ integrated solutions serve individuals who have behavioral health disorders that exacerbate coexisting medical conditions, resulting in higher hospital admissions and emergency room (ER) visits. The Company has developed analytics for identifying which individuals on an insurance plan are “high utilizers” with impactable costs due to having a substance dependency or an anxiety disorder. Catasys targets these patients with its proprietary direct outreach capability to enroll them in the OnTrak™ patient-centric treatment program. OnTrak™ integrates evidence-based medical and psychosocial interventions in a 52-week outpatient program that has shown a 50%+ reduction in total costs for health insurers’ enrolled members—stemming from decreases in hospital days, ambulance usage, and ER visits. The Company has entered into contracts with several insurance providers for OnTrak™, which is now available in 10 states, including through Aetna/Coventry, Humana, Centene, Fallon Health, Health Alliance Medical Plans, and Reliant Medical Group. Collectively, this entails approximately 2.3 million Commercially Equivalent Lives (CELs). 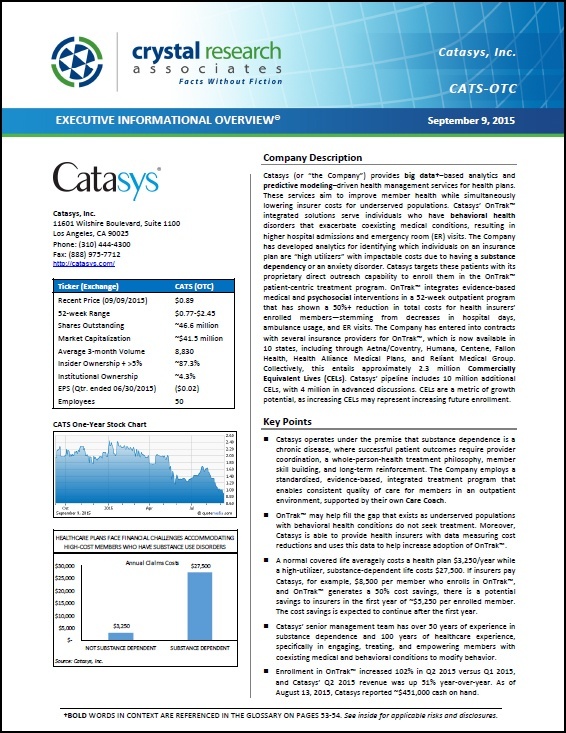 Catasys’ pipeline includes 10 million additional CELs, with 4 million in advanced discussions. CELs are a metric of growth potential, as increasing CELs may represent increasing future enrollment. * The Corporate Snapshot was last updated on September 9, 2015.